Despite the volume of articles about domestic and sexual violence – be it an update on the law, police failings or cuts to support services – they’re always accompanied by the same stock photo. The photo usually shows a woman (usually young, thin and white), curled up foetal either with her head in hands, alone or near a man’s fist, sometimes holding her palm up to protect her. Images help us process information, so it’s troubling that this is how violence against women is repeatedly, almost invariably visualised. Violence against women is difficult to portray in a photo, and the woman-in-crisis may do a good job of making readers feel uncomfortable. Nevertheless, her ubiquity does survivors a huge disservice. We must learn to locate the traumatic within the everyday. That is where it exists. Unlike the woman-in-crisis, survivors of violence do not spend their lives hunched over in shadows in the foetal position. Survivors are experts at coping; survivors go about their lives and routines desperately pretending things are normal. Survivors look after children, go shopping, go to work, even go to parties; survivors are experts at navigating and negotiating danger. Sometimes survivors talk about it, but a lot of the time they don’t. Survivors endure terror long after separating from abusive partners, and long after violent incidents have occurred: survivors duck and dodge and drown bad memories; survivors relive terrifying flashbacks in their sleep. Survivors dread smear tests because of what they might trigger; survivors deal with long-term health issues with long names like endometriosis and vaginismus. Survivors are treated for the same mental illnesses that soldiers develop in wars. None of this is reflected in those stock photos, which reduce a complex issue to a simplistic myth. They are a wasted opportunity to enhance our understanding of what it means to survive interpersonal violence. As long as we identify survivors as curled up and hunched over, we will never give them the validation and tremendous respect that they deserve. As long as we only recognise domestic and sexual violence as physical, we will continue to ignore the psychological. Psychological control is the foundation of all interpersonal violence: a perpetrator’s best weapon is a victim’s own mind. But if we only identify harm as physical brutality, we will fail to identify violence within our own relationships, and among our friends and family. We will continue to conflate possession with affection and isolation with devotion, forgetting that not all violence is physical. We will fail to recognise that love and terror are not as dualistic as we’d like to think, and we will fail to see emotional violence for what it is. Ultimately, we will overlook the insidious violence that 1 in 3 women experience in their lifetime. So what instead? Articles about domestic violence could include photos of a man examining a woman’s shopping receipts, checking that she has bought everything he asked for and has the correct change; or it could be a man checking a kitchen cupboard, making sure all the pans are stacked in the exact order that he wants. This is the level of torturous control that perpetrators of domestic violence exert, yet we probably wouldn’t recognise it when we see it, because we’re never shown it. It remains hidden. In order to fully understand violence against women, we need to see more diversity in its visual representations. We need photography that doesn’t stereotype and place survivors in the shadows of photos and the shadows of public consciousness. We must locate survivors within normality, and we must acknowledge their diversity in age, ethnicity and ability. There is no typical survivor. Survivors could be anyone and anywhere; they might be next to you on the bus, in your workplace, in your friendship group. You’re unlikely to find the ones you know hunched in a shadowy corner. Janey is passionate about ending violence against women. She tweets @rebeljelly. 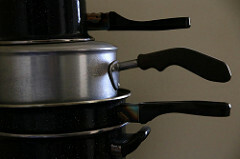 The image used depicts stacked pots and pans.